The Lake Chelan Reclamation District has, and is continuing to, implement our Cross Connection Control Program as required by the Department of Health WAC 246-290-490. The district is required to store information on file regarding backflow assemblies, test reports and locations of the assemblies. A backflow prevention device is required, and protects the domestic water distribution system from a potential backflow incident. Pursuant to the Washington State Department of Health Requirements to protect the public health and safety, the Lake Chelan Reclamation District (LCRD) shall require all customers receiving potable water from the LCRD’s water distribution system to comply with all state and local regulations requiring approved backflow assembly devices. In accordance with these regulations to protect the LCRD's water system and public health and safety, these approved devices shall be installed, maintained and tested annually by an approved and licensed Backflow Assembly Tester at the customer’s expense and liability. The annual test report shall be submitted to LCRD’s Cross Connection Control Specialist no later than May 31st on an annual basis. Please feel free to contact our office regarding any questions that you may have. If you would like to have Dave Walters, our Cross Connection Specialist, visit your property to help assess what you have, or what you may need, please call our office at (509) 687-3548 or email dwalters@lcrd.org. A: Lake Chelan Reclamation District’s water system is designed to keep water flowing from our distribution system to you, the customer. Backflow can occur due to high pressure on the customer side, or low pressure in the company’s water system. Backflow is the undesirable reversal of water flow in a potable water system through a cross-connection. This situation may allow liquids, gases, non-potable water, and other substances, from any source, to enter a public water system. Q: What is a Cross Connection? A: A cross connection is a point in a plumbing system where the potable water supply is connected to a non-potable source. Briefly, a cross connection exists whenever the drinking water system is or could be connected to any non-potable source (plumbing fixture, equipment used in any plumbing or irrigation system). Pollutants or contaminants can enter the safe drinking water system through uncontrolled cross connections when backflow occurs. Q: What is a cross-connection control program or a backflow prevention program? A: This program is required by the State of Washington to detect and prevent possible sources of non-drinking water from entering a public drinking water system. The program is a combined cooperative effort between plumbers, health officials, water system operators, property owners and certified testers to follow guidelines for controlling cross-connections and implementing means to ensure their enforcement so that the public drinking water supply will be protected both in the city main and within private facilities. The elements of a program define the type of protection required and responsibility for the administration and enforcement. Other elements ensure continuing education programs. Q: Where are Cross Connections Found? A: Every water system has cross connections. 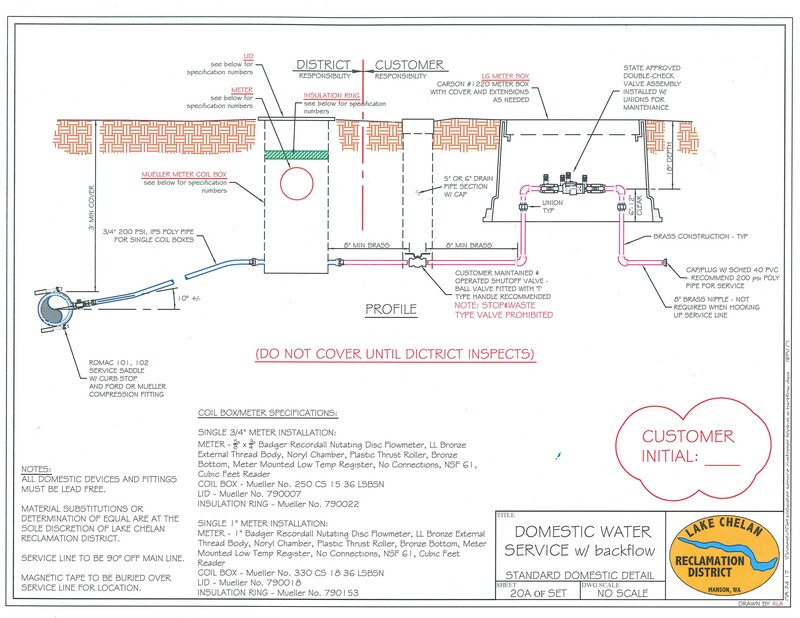 Plumbing codes and State drinking water regulations require cross connections to be controlled by approved methods (physical air gap) or approved mechanical backflow prevention devices or assemblies. The various types of mechanical backflow preventers include: reduced pressure backflow assembly (RPBA), reduced pressure detector assembly (RPDA), double check valve assembly (DCVA), double check detector assembly (DCDA), pressure vacuum breaker assembly (PVBA), spill resistant vacuum breaker assembly (SVBA) and atmospheric vacuum breaker (AVB). For a backflow preventer to provide proper protection, it must be approved for backflow protection, designed for the degree of hazard and backflow it is controlling, installed correctly, tested annually by a State certified tester, and repaired as necessary. Q: What is the most common form of cross-connection? A: The ordinary garden hose is used to create the most common form of cross-connection. A hose can be easily connected to the drinking water supply and used for a variety of potentially dangerous applications. An example would be a garden hose attached to a service sink with the end of the hose submerged in a tub full of detergent. Another example would be a garden hose attached to a faucet and the other end lying in a swimming pool. Another example would be a garden hose attached to a faucet and the other end attached to fertilizer/pesticide hand held sprayer. Q: Is LCRD the only water system enforcing backflow regulations? A: No, all public water systems are required to implement cross-connection control programs in the State of Washington. Q: Who needs a backflow preventer? A: LCRD requires backflow protection to protect its public water supply from pollution and contamination in accordance with Washington State Regulations WAC 246-290-490. Therefore all backflow prevention assemblies installed to protect the public drinking water supply must be tested prior to occupancy. This includes backflow protection on fire suppression systems, domestic water services and lawn sprinkling systems. In accordance with the regulations, these assemblies must also be tested annually by a Certified Back flow Assembly Tester (BAT). This testing will be enforced by LCRD at the owner’s or his agent’s expense. In accordance with the regulations, failure to install, test or maintain backflow prevention assemblies in good working condition will result in denial of water service or termination of existing water service. Q: How would a backflow issue occur with a lawn irrigation system? A: When there is a sudden reduction in the water pressure in the distribution system, such as during water main breaks, or when a fire hydrant is opened, water flow can be reversed. This can create a suction effect, drawing water from your home, irrigation system, pool, horse trough, etc., into LCRD’s potable water system. Q: How would a backflow issue occur in a commercial building? fountain and green ice rolling out of an ice machine. The contaminants were traced to an error by a maintenance person. A pump for the air conditioning system burned out and the maintenance person, unaware of the danger, connected the system to another pump used for potable water. The result caused large doses of bichromate of soda to be forced into the drinking water supply, causing the dramatic appearance of yellow water and colored ice cubes. Q: Why does a soft drink dispensing machine require backflow protection? A: Soft drink dispensers (post-mix carbonators) use carbonated water mixed under pressure with syrup and water to provide soft drink beverages. Many, if not most internal water pipes, are made of copper. When carbonated water comes into contact with copper, it chemically dissolves the copper from the pipe. This copper-carbonate solution has been proven to be a risk to the digestive system. Q: Is my home or my business “grandfathered” in? A: There is no “grandfathering” of backflow devices which are out of compliance with current regulations. The State considers backflow regulations to be a health and safety issue. These issues must be addressed in a timely matter for the safety of the public water supply and the health of our customers. Q: Why is LCRD responsible for enforcing the rules, since they are State of Washington rules? Washington State Department of Health/Office of Drinking Water then enforces the backflow regulations by requiring the water purveyors to administer the backflow program locally. LCRD must report to the State annually to determine if the LCRD is administering the program according to regulations. Q: Who is responsible for the testing and maintenance of the backflow prevention assembly? A: It is the sole responsibility of the water customer to ensure their assembly is in satisfactory operating condition at all times. A notice of the annual test date will be issued to the water customer of record by LCRD, 60-days prior to the annual due date. The customer must contact a certified Backflow Assembly Tester to perform the test. If any repair work or maintenance is performed on the assembly, a certified Tester must retest the assembly immediately and submit the test results to LCRD. Q: When are backflow devices required to be tested? A: All devices are required to be tested upon installation of the device and annually thereafter. Any time a device is worked on or repaired it must also be retested. LCRD would like all backflow devices to be tested prior to May 31st annually. Q: Why do backflow devices have to be retested? A: Backflow devices are mechanical devices with working internal pieces. A piece of debris, dirt or even calcification of water can cause the device to stop working. Q: Who do I call to have a test completed? A: Any certified backflow prevention assembly tester who is registered, may be called on to test the device. If the device is located on a fire system, the tester must be employed by and Approved Fire line Tester. The tester will return the original report of the test to LCRD and will give the customer a copy of the test report. Q: What will a test cost? A: The cost of having a device tested varies among testers. The cost is also dependent on several factors, including the size of the device, where the device is located, the type of device, etc. You may want to call several Certified Testers to obtain quotes for your test. Q: Who can I contact for more information on backflow prevention? A: Lake Chelan Reclamation District may be reached at 509-687-3548.